According to Malaysian Prime Minister, Najib Razak, the debris found on the island of Reunion, just off the coast of Madagascar, conclusively belongs to the missing Boeing 777 known as Flight MH370 that went missing over 514 days ago at time of the writing of this piece. His statement emphatically states that the plane and all 229 passengers and crew were killed with the plane resting somewhere on the bottom of the Southern Indian Ocean. 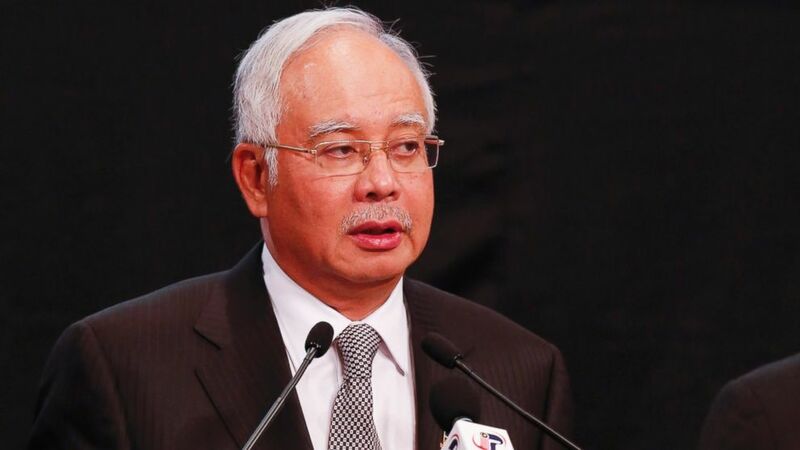 Malaysian Prime Minister Razak delivers the premature news that MH370 is at the bottom of the Indian Ocean. French and other investigators in Toulouse, France, examining what is said to be a flapperon to a 777 jet, say that while there is a strong assumption that it does belong to MH370, further testings are needed. They have not declared it to be that of the missing plane at this point. Razak, having over-stepped boundaries and leaping the gun to get the bad news out to families of the missing passengers and crew members, uttered these words without regard for the fact that there has been no official verdict shared by investigators in France. This isn’t the first time Razak has made such a statement. The first came only days and hours into the search for the missing plane after Malaysian officials had miserably failed to follow any sort of protocol and severely bungled their handling of not only a missing plane but, also in terms of having an un-identified plane crossing their airspace and doing nothing to find out what was going on or why. They stalled on giving out reports to other nations who were calling for the details of how Malaysia Airlines and the Malaysian government had handled the situation or lack thereof of any proper actions. This lands questions squarely at the reason for Malaysian government officials, wanting this whole thing to be put to bed with such zeal that it loads questions in many people’s minds as to why. What is it that the Malaysian government knows that it’s not telling the rest of the world? What is there to this and why are they being so quick and insistent that the plane is gone and all 239 aboard, dead? Why do they want this to “go away”? While Razak was busy telling the world that this was in fact, MH370 and not having it confirmed by French investigators, Malaysian Transport Minister Liow Tiong Lai, was active in putting out new conferences about other debris that had allegedly washed up on the shores of Reunion like a plane window and seat cushions, making it seem as though it was suddenly now time for these pieces to begin showing magically up on the shores. When asked what these items were, Lai stumbled on his words. “There are many items. I can’t itemize one by one. There are many items collected and we are sending them to France,” Lai stated at a recent press conference. Australian officials heading up the search, countered Lai’s announcements by saying that they remained extremely skeptical saying that the additional debris found don’t even seem to be from an aircraft. If that is the case then, it should stand to reason that Madagascar and the eastern shores of Africa should also now be seeing washed up debris pieces as dictated by models that the experts have hypothesized would be the drift of the currents and winds for that area. Thus far, it has not. The assumption seems to be that the piece of plane is indeed from a Boeing 777 and since there are no other missing 777 planes, it therefore, has to be from MH370. Most certainly, it makes logical sense that if MH370 is the only plane missing/un-accounted for, then any plane part that washes up on any shore in the region it was believed to have gone down, must belong that specific plane. However, there are so many unanswered questions about how Malaysia dealt with this case right from the moment it cut off communications, which has been admitted by Malaysia and other authorized to have been seemingly deliberately done, re-crossed the Malaysian peninsula, was detected on military radar but, nothing done about it and only many hours later, when MH370 was expected to arrive in Beijing and didn’t, did Malaysia report the plane as missing. Several hours had gone by where no one was looking into the mysterious circumstances or the whereabouts of the plane when there was no communication from it to the hand-off tower. Malaysian traffic controllers gave Cambodian air traffic towers false information and no one looked into it after that. CNN “expert” Les Abend, goes on in a CNN report about how the families are traumatized and naturally, don’t want to accept the evidence as being real…especially, given the distrust that they have had with the Malaysian airlines and the government in THIS ARTICLE. Naturally, family members are angry. They have been mislead by so much throughout these past some 514 days since their loved ones went missing with false reports of debris and other things like “pings” thought to be from the black boxes of the plane, laying in the ocean floor that eventually led to nothing, they have every right to be skeptical now too. As a matter of fact, anyone with half a mind would be less than believing at this point until or unless, the entire plane has been found as proof positive. There’s a lot of dirt under fingernail type questions that needs to be asked for good reason. The fact that there’s no other missing Boeing 777 planes does not mean that this piece is from MH370. Even should it be proven to belong to the missing plane, there is no real evidence that it wasn’t planted to be found as it seems that Razak is anxious to have this wrapped up and sealed as a fated flight even if searches continue for the rest of the entire plane. Searchers have already stated that it may be years, if at all, that the plane might be found and we may never know the reason for the plane’s disappearance or what happened to cause it to go missing in the first place. It’s akin to looking for a needle in a giant field of haystacks at this point in time. What does stick out is the idea that nothing was found during the first few weeks of searching by air and water. No debris, no oil slicks, nothing. There was no signs of a plane crash for thousands of square miles found anywhere. So, how is it that suddenly, this debris piece has beached itself without other pieces having been spotted at the beginning or now? Why has it been the only piece of the plane, if it is that of MH370? If this piece is found to be that belonging to MH370, I still have skepticism towards the entire thing and would have to question whether the piece had been planted by some method to have washed up as it did. There are just too many unanswered questions that are possibly indicative of dirt under fingernails, not the least of which, includes Razak’s determined eagerness to deem this plane gone and all aboard dead. I’ll keep saying it. Something is fishy with this entire thing and I hope that it will one day be revealed as such. At least, that’s the way that I’m seeing things from My Little Corner of Life.